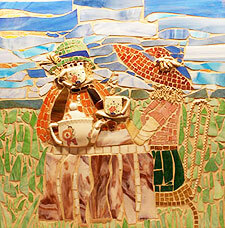 "The ancient art form of mosaics is my way of making sense of a complex and uncertain world. My ideas come from a wellspring of emotion and restless creativity. I use color and texture to represent sentiments in need of self-expression and visual manifestation. 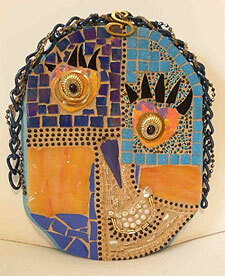 My designs are largely spontaneous, allowing the mosaic to evolve naturally. I let my imagination run with themes of abstract humor and passion toward a clarity that resonates with the viewer. I love the challenge of putting broken pieces together forming a mosaic that elicits feelings when words are not enough. I arrange materials to fit my designs like puzzle pieces formed by the spirits of inspiration." Susan uses the "Pique Assiette" method of mosaic-making, employing all types of materials in the process: stained glass, old dishes, tiles of all types, found objects, shells, rock and pebbles, and old jewelry. Some of her recent mini-mosaics are featured in her current Brattleboro show; their construction includes individually applying vast numbers of tiny beads to a backing surface. 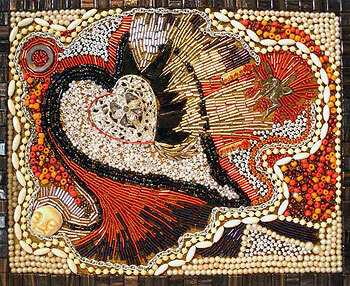 A certified expressive arts therapist, master teacher for arts in education programs, and arts programming consultant for special populations, Susan Rosano walks her talk: "Since 2010, I have been using my mosaic art work to help myself through the difficult grief process of losing my youngest son. Being an expressive arts therapist, I know that the best way to process grief is through the arts." The arts are also helpful in other aspects of personal growth, and Susan brings these opportunities to both the young -- through school programs facilitating the making of murals, mosaics, and banners -- and to the elderly through arts-based programs that focus on "creative aging" to celebrate both the past and the present. Murals that Susan has created or facilitated grace the walls at schools, hospitals, and other public spaces around New England, and her mosaics have been shown extensively throughout the region. 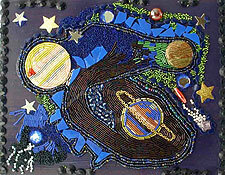 Commissioned pieces are a specialty, and she teaches mosaic classes at her studios in Connecticut and Vermont. For further information, contact Susan by email at suzydraw@aol.com, phone (802) 365-9970, or visit online at www.newenglandexpressivearts.com.